FARNBOROUGH, UK ― December 2014 ― Gen3 Systems Limited, a specialist British manufacturer and distributor, is pleased to announce the successful installation of the MBTech NC25 PCB Cleaning System at Briton EMS’ facility in Bedford, England. 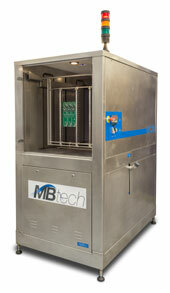 Briton EMS purchased the MB Tech NC25 Conveyorised Batch Cleaning Machine from Gen3 Systems. The NC25 Batch Cleaner is specially designed around a patented filtration system, providing high cleaning performance. The system is designed for use with a number of chemistries in a closed-loop configuration that offers optimum performance with minimum waste and hence reduced operating costs. The machine also benefits a unique process of combining forced convection and vacuum. The NC25 system boosts one of the most cost efficient and waste friendly systems available on the market. Mb-Tech equipment is designed in order to respond to three essential criteria; efficiency, low running costs, and environmental respect. Briton EMS selected the system due to the company’s need to recycle rinse water and avoid sending this to drain during each cleaning cycle. The company opted for a closed-loop system with a di-ionisation water module. Briton EMS received customer feedback that showed that the NC25 was delivering high quality cleaning of PCBAs soldered with NO clean solder paste and solder wire beating the customer’s tight cleaning specification and allowing the PCBAs to meet their challenging performance requirements.